I made reservations at another RV site near Tallahassee that was closer to the interstate but when I got there I was very unimpressed. 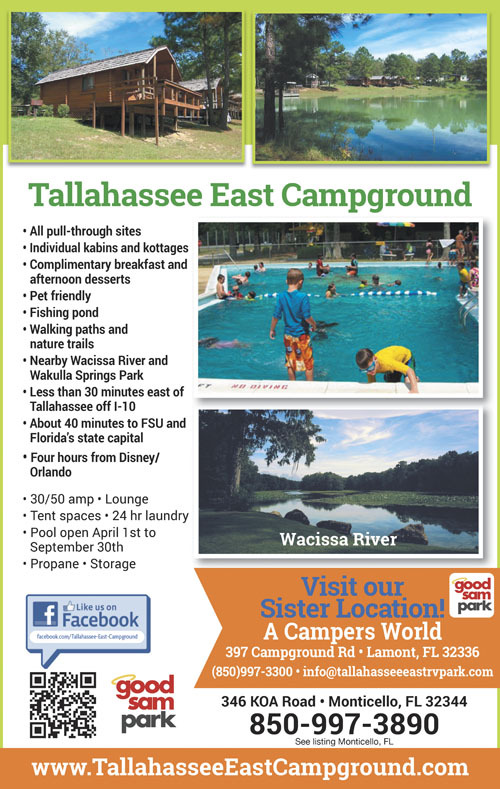 I had seen Tallahassee East Campground from the Interstate, so I went to check them out. I was very pleased to find this campground! It had some shade, the electric and water worked fine and the managers in the office were very friendly and helpful. Very run down. Nice people but campground lacked and ambiance. This place is a dump, the roads are bad making big puddles and it shows a lake but it is a pond. There wasn’t even a picnic table at our site! I’m not happy that Good Sams gives it an 8 star, now I don’t have any faith in the ratings. I have learned now to do deeper and look at the customer reviews! This place was a muddy mess. Took my 42 foot class A in clean and came out a mess. Good Sam should be ashamed of themselves for putting they're brand on this one. This site should not allow RV's in under these conditions. Certainly not worth the 42$. Would have kept driving to another park had I known how bad this place was. It's a long drive from I 10 to the site on a winding road. Thumbs down on this one, especially after heavy rains. Lady at check in was very nice. Was willing to put us in another site if we wanted to use satellite. I said no, we had a very long day and wanted a good night's sleep for another long day the next day. The game room was cute and open until 11 pm, with tv,pool table and WiFi that was ONLY at the office. The swimming pool looked like it had been empty for some time and was dirty. They did offer a complimentary breakfast. We were charged $41.00 plus $3.00 for electric. And that was with good sam discount. We were very disappointed in this place after paying $43.00!! About 9:30 the power started surging off and on. Husband went out to check the electric hook up. After 30 minutes I called both numbers that was given to me in case anything happened after hours. Voicemail on both and never a return call. We finally unhooked and started the generator. Neither one of us slept much that night! In the am we plugged back in and power was still out. I called the office. She was not aware of the problem. But, had a bunch of excuses: Owners husband died last year Last week a car accident put out their phones We might have gone over our amperage (which we did not) Maybe there was something wrong with our rig? (Works fine after there) The grounds were full of people after the hurricane. I said I was sorry but, we paid to stay there also. She said she had customers and would call someone and get right back to me. I told her we were leaving soon. 45 minutes later and no call. It is now 10 pm that evening and still NO CALL!! So, if you want to spend $43.00 a day and be ignored when there is a problem, stay here. There are some really nice RV Resorts close by for $40.00. To the owners: I was very nice to you and gave you the opportunity to respond and rectify this situation in some way before I wrote this review. We will never be back to get ripped off again! Very poor . I was so disaponted. Over grown grass , very run down and tired looking. We were traveling from Texas to Disney World and needed an overnight stop and found this campground online. Reviews that I saw were on park advisor app and even though the reviews were not great, we just basically needed a place to spend the night and mainly dump our tanks. The place looks terrible. Dirt roads that a VW bug would be swallowed in the pot holes. All sites are grass and have huge low spots as well. The septic drain was overflowing and we didn’t even get to dump. Both campers on either side of us advised of the same thing. So we paid $54 for a run down place and didn’t even get to dump. Sad that Good Sam even puts their name on this. So if you need a place to just park for the night, you’d be much better off parking at Wal-Mart and that’s free. Things haven’t changed too much from KOA ownership. Our site was grass, every corner was a different height. Interior roads horrible. We did not even stop to get a refund and went to another campground. From the highway it looks amazing, but once you get behind the office, not so much. end of summer trip from Minnesota to Florida. campsites unkempt. streets in campground had muddy puddles. pool had green water. bathrooms have no air conditioning. campsite next to us still had a trash bag left from former campers. no WiFi and no Cable TV. complimentary breakfast was banana/blueberry muffins,apples, oranges & coffee. morning and evening staff were VERY nice. Extremely low water pressure. Unfortunately the pool was full of bugs and leafs - it is surrounded by a lot of trees. But, they offered a great complimentary breakfast - no complaints about that. We ended up not even staying. We pulled thru and saw that the sites were in awful shape, the place was full of trash and old full time RV's that were in just as awful shape. Definitely not worth the price they were asking when you can pay the same and stay in a very nice RV park closer to town. Older campground. It needs some repair. The food for campers was great. Good for a stopover. 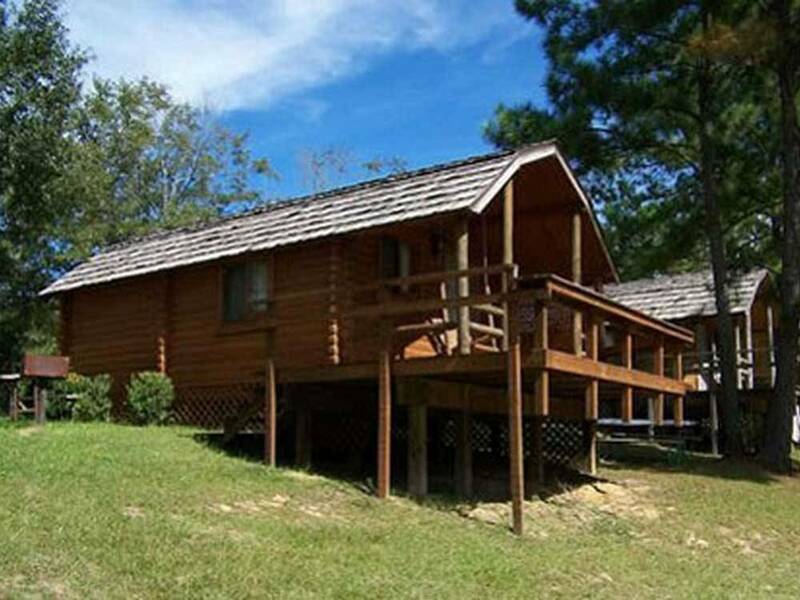 We rented the two room lake view cabin and based on the price we had pretty high expectations. Very disappointing! Dead bugs everywhere. Could barely get in the cabin because of the tree right in front of the steps. Curtains (I guess you could call them that) were stained and yucky looking. Very inconvenient not to have a place to hang towels or dishrags. Virtually no internet service. There had been lots of rain, but potholes and ruts throughout the park still seemed excessive. Park store had zip. Swing on the porch was really the only positive. Unkept, unprofessional at desk, empty pool, playground looked like a scary movie, excessive bugs from lack of maintenance. Need to clean up, mow grass, trim, blow, fix fences, remove trash. Permanent residents need to be separated or a place to put all their stuff. Not relaxing at all. No wifi! This park was a big disappointment. The campground is in a distinct state of neglect and disrepair. Dirt roads to sites were full of potholes. Many washers and dryers were out of service. Many permanent residents were there in dilapidated equipment - looked trashy. That is too bad because it is a good location east of Tallahassee and a nice, treed setting. It is a former KOA campground, and we can understand why they parted company. The restrooms were still nice and clean, but that was the only real positive. We will not stay here again and cannot recommend it to others.